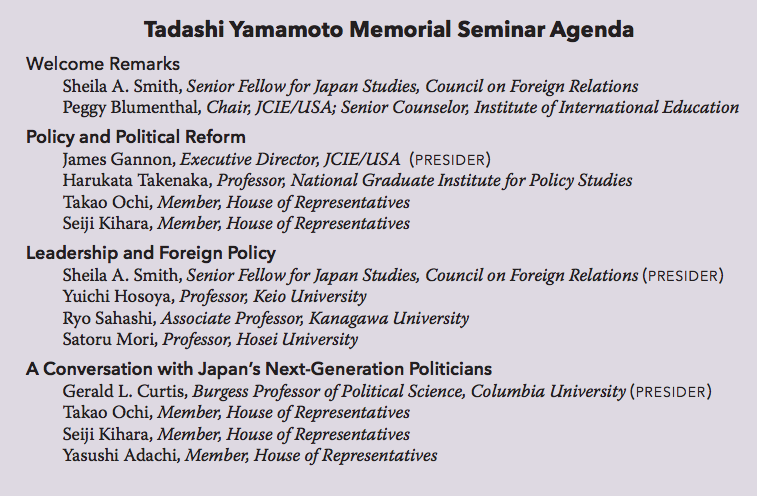 The inaugural Tadashi Yamamoto Memorial Seminar, which was co-organized by the Council on Foreign Relations and JCIE, convened more than 50 Asia experts to discuss the challenges that have kept Japanese politicians from projecting strong political leadership, the impact this is having on foreign affairs, and the prospects for change under Prime Minister Shinzo Abe. 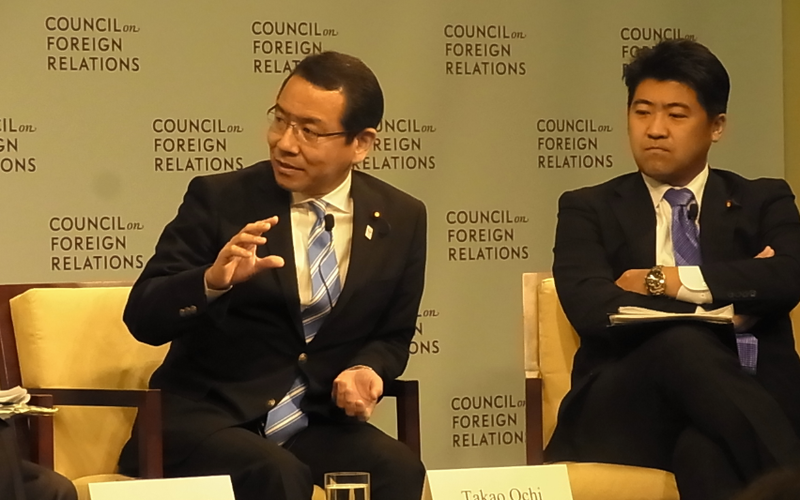 In keeping with Tadashi Yamamoto’s lifelong efforts to cultivate the younger generation of leaders and encourage them to engage more actively in international dialogue, the seminar featured three up-and-coming Diet members and four of Japan’s most promising younger policy experts. The increasing frequency at which Japanese prime ministers have shuffled in and out of office—the post has rotated six times in the past six years—has become a symbol of instability and weak political leadership in Japan. Panelists remarked that, paradoxically, this trend has emerged despite the major reforms implemented in the 1990s to strengthen the prime minister’s hand by empowering the Prime Minister’s Office and expanding the Cabinet’s role in the legislative process. According to one panelist, the frequent rotation of prime ministers is actually a natural characteristic of Japanese political culture and recent years reflect a return to earlier patterns. Others argued that, while the previous political reforms heightened expectations for the prime minister to deliver on his campaign promises, important obstacles remain that hamstring the ruling party’s ability to govern effectively. There was general agreement that a number of measures need to be taken to enhance the ability of Japan’s top leaders to move more decisively, regardless of the length of prime ministers’ tenure. These include further efforts to strengthen the power of the Prime Minister’s Office, cultivating stronger think tanks and other alternative sources of policy advice, and, most importantly, decreasing the power of the Upper House of the Diet relative to the Lower House so that the Upper House is less liable to bog down or veto legislative initiatives. 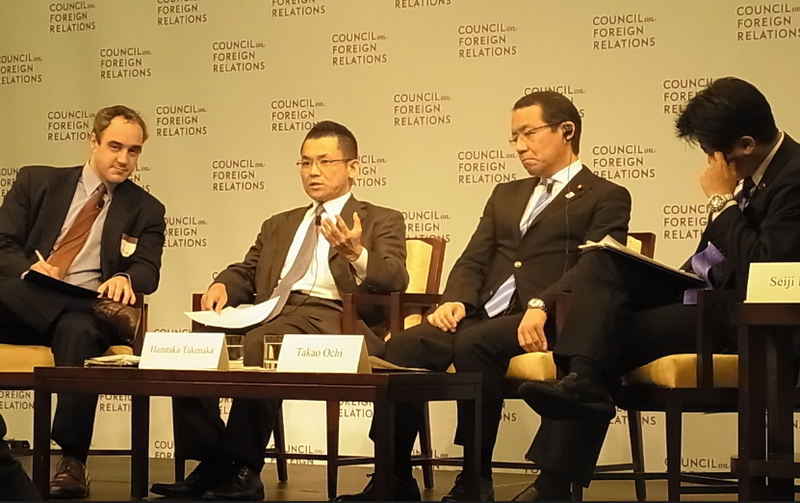 Several American participants reflected on how the frequent political turnover in Tokyo has made it more difficult for foreign governments to work with Japan. The heightened uncertainty about whether Japanese leaders can deliver on bilateral commitments has become a stumbling block, but a particularly consequential problem has been the difficulty that Japanese prime ministers, foreign ministers, and other top leaders have had in building sufficient levels of trust with their overseas counterparts when they are in office for such short terms. However, there may be a temporary reprieve from recent political instability. Japanese panelists agreed that Prime Minister Abe’s Liberal Democratic Party (LDP) is almost guaranteed to win the July Upper House elections, likely giving the ruling coalition a veto-proof majority in both houses of the Diet for the coming three years. In recent years, frequent parliamentary and party elections have triggered changes in the prime ministership, but Upper House victory should give Abe and his party the capacity to control government for the next several years. Despite their optimism, many noted that Abe’s success is by no means guaranteed. Rather, it depends on whether his “Abenomics” initiative can revive the Japanese economy. In the assessment of several panelists, the Japanese electorate is likely to give the prime minister two years to see if the Japanese economy picks up, and if it does not he will lose their support and face an intra-party revolt. 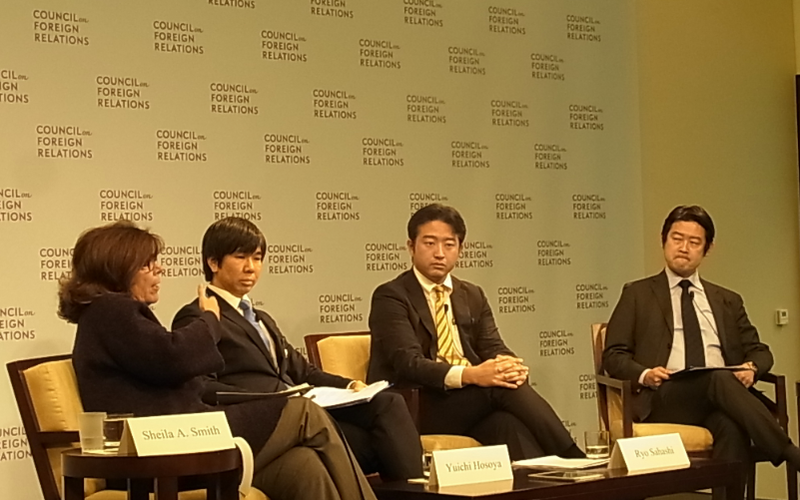 Panelists were surprisingly optimistic about the prospects for one element of Abenomics, namely the prime minister’s gamble that he can rally sufficient political support for Japan to successfully negotiate and ratify the Trans-Pacific Partnership (TPP) agreement with the United States and other Asia Pacific countries, even though they felt that the deal’s autumn deadline is likely to be extended. As evidence, one speaker noted that Abe managed to gain backing for his announcement of Japan’s entry into TPP negotiations from all national and local arms of the LDP within a mere 10 days, a stunning feat given the array of special interests that have opposed the trade pact. Still, while many felt that Abe would succeed in his first big test of joining TPP, there was considerable skepticism about his capacity to advance the structural adjustments to the economy that are part of the “three arrows” of Abenomics. It may become more difficult to muster political support for these painful measures if the current monetary easing succeeds in sparking a short-term economic rebound that reduces pressures for further reforms. 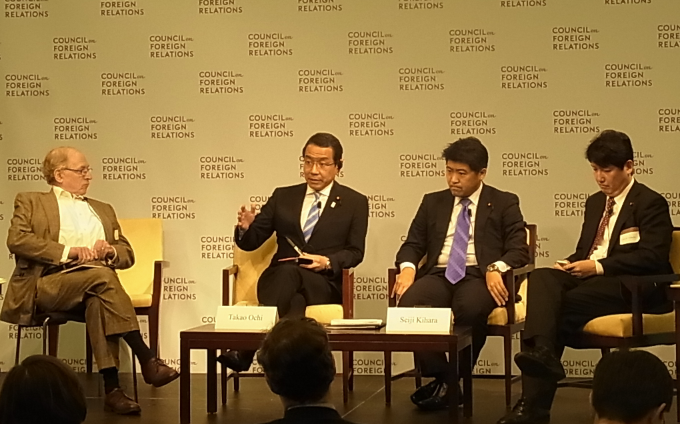 The one issue that many participants felt could undermine Japan’s economic recovery and potentially bring down the Abe administration is the mismanagement of regional relations. While Japan was generally seen as striving to maintain the “status quo” in territorial disputes involving China, Korea, and Russia, an undue emphasis on so-called “history issues” has given rise to perceptions that it is playing a dangerous game that can destabilize regional relations. In the week prior to the seminar, Prime Minister Abe downplayed Japan’s wartime aggression, and 168 Diet members visited the controversial Yasukuni Shrine, which honors Japan’s war dead and enshrines 14 Class A War criminals. One prominent American expert warned that continued signs that Japanese leaders intend to take a more nationalistic stance may lead foreign investors to conclude that the Abe administration’s top priority is not really economic reform, sparking a withdrawal of foreign investment and triggering an economic slowdown that topples the prime minister. Other American specialists noted that further efforts to deny Japan’s war history are likely to inflame US public opinion and damage US-Japan relations as well. American participants also expressed concerns about the constitutional reforms that are being considered by the Abe administration, including proposals to weaken Article 9, which bans the use of military force, and Article 96, which sets the threshold for amending the constitution. Many felt that constitutional revision is probably not necessary to enable Japan to exercise its right to collective self-defense within the framework of the US-Japan alliance. Rather, a reinterpretation of the current constitutional provisions should suffice. In particular, US participants felt that efforts to lower the Article 96 threshold would be harmful, not only because it may further inflame tensions with Asian neighbors concerned that it is the first step toward gutting Article 9, but also because it is likely to lead to a flurry of campaign promises and proposals for additional constitutional revisions, which will divert political capital away from other important policy priorities and make it even more difficult to advance needed legislation. The Japanese panelists ended on an upbeat note, remarking that Abe is likely to be very careful about expending political capital even after the July Upper House elections, making the calculation that his legacy depends on focusing on TPP and other economic issues and steering clear of further inciting the debate over history issues after witnessing such a strong reaction to the events of the last few weeks. This means that prospects for his administration and for greater domestic political stability in the short- to mid-term will depend heavily on the success of Abenomics and the capacity of his more pragmatic advisors to continue to hold sway. 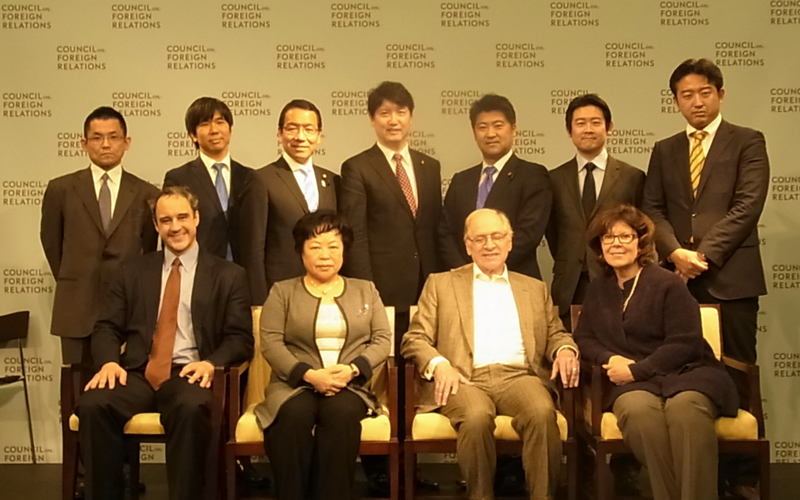 The Tadashi Yamamoto Memorial Seminar was made possible thanks to the Council on Foreign Relations and with the support of the Smith Richardson Foundation, MRA House, and donors to the Tadashi Yamamoto Memorial Fund.